In 2015, an area in Alaska (USA) has suffered a terrible tsunami in the past 100 years. In October 2015, the Taan Fjord area in southeastern Alaska suffered one of the worst waves ever recorded. According to the reports, the waves were nearly 200m high, the fourth largest in 100 years. It was confirmed that a mountain mass of up to 180 million tons had fallen into the sea. 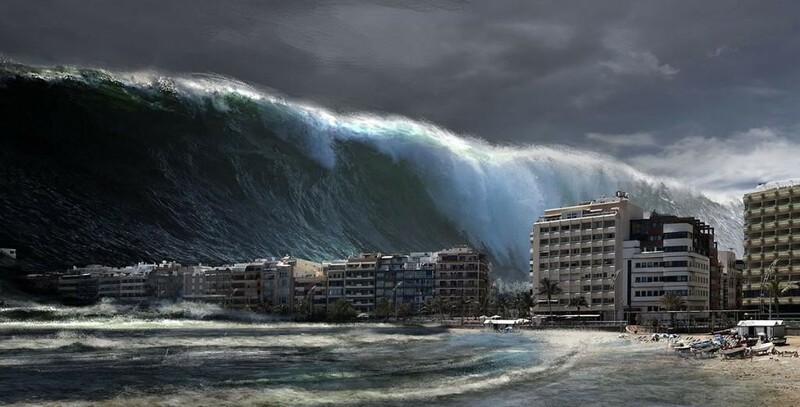 The terrible pressure of the mountain caused a large amount of water to rise, creating a tsunami. But that was the story of the day before. Recently, experts have found the truth behind the event: climate change. Even more frightening, they predicted that with the increase in global temperatures, similar events would be much higher. "There will be so many similar erosion occurring, as icebergs are shrinking and smaller, while eternal ice is getting thinning," said Bretwood Higman, a geologist. American. "Forty years ago, Taan Fiord did not even exist, everything was covered in ice," added Dan Shugar, a geologist at the University of Washington. But Tyndall Glacier is shortened. In the period of 1961-1991, it shrank about 16km, thinning by 300m, and remained stable today. And the story does not stop there. Melting ice not only opens up a small bay area, but also causes a large amount of ice to play a fixed role, lifting the upper mountain also disappears. As the mountains collapsed, the shape of the bay created conditions for a giant wave to reach up to 96.5 km / h.
"Imagine throwing a bowling ball into the lake, versus throwing it into a tub." - Shugar said. "Water will hit the wall of the bathtub, but after hitting it can not move anymore, but only straight up." This is not the biggest wave, but also at a terrible level for similar events (tsunamis caused by landslides). "The biggest wave is in Alaska, in Lituya Bay, because of the landslide at the end of the glacier, which pushes the waves up into a narrow bay," said Shugar. "However, the event originated from a large earthquake from earlier." The event was held in 1958, with a wave of up to 523m. Of course, in the past, the Earth must have suffered more terrible catastrophes. But that does not mean that the tsunami is weak. They are still extremely scary. As noted at the tsunami event in 2015, experts were immediately to the scene. But eight months later, the cause was announced due to landslide. Fortunately the wave swept through the uninhabited area, so no one was injured. Shugar, however, said it was still possible for ships to cross the fjords in Alaska at the right time. As in Greenland in the past, a similar incident left four people dead. In other words, this is an event, phenomenon is not rare. It has happened, and it is very likely to continue in the future. "When the slopes change the slope by environmental conditions, the rocks are gradually removed, probably each island, but it could also be a large one," said Martin Luthi, a geologist. University of Zurich (Switzerland) shared. "There are quite a lot of erosion occurrences in frosty places, creating huge tsunamis." "Clearly, people need to set a standard for predicting such catastrophes," said Ronadh Cox, geologist at Williams University, a landmark study. America). How much does the F1 race cost? Man United will buy Gareth Bale ?